YogaHub is really excited to be bringing the very knowledgable Tom Toher to our studio this weekend for an amazing Sound Bath workshop. Below is a Q and A we did with Tom so he can tell you more about what sound baths are. Hey Tom! So, what is a sound bath? As the name suggests, a Sound Bath is an immersion in beautiful sounds and vibrations that are healing for your body, mind and spirit. A Sound Bath is a deeply relaxing, meditative experience which can take you on a journey of deep relaxation, healing and self discovery. Everything in the Universe, including our body, is composed of vibrations. Every organ and every cell in our body vibrates at a particular frequency. Sound and vibration travels up to five times more effectively through water. As the human body is made up of over 70% water we can understand that sound and vibration can effect us at a cellular level. During a Sound Bath you will experience deep relaxation and a profound sense of peace and well-being. At the start, I will lead you in a short guided-meditation to prepare your body and mind for the experience which follows. You will experience the healing power of Tibetan Singing Bowls, Gongs, Shamanic Drums, Koshi chimes and Voice. The healing frequencies and vibrations will wash away all your stress, tension, and cares. All you have to do is lie there and allow the healing sounds and vibrations to wash over you. 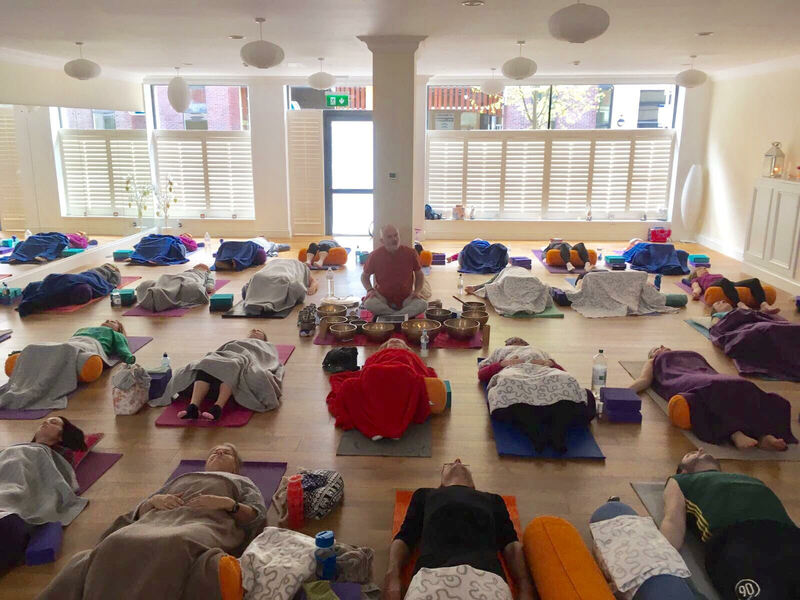 For the Sound bath you will lie on a yoga mat, with a cushion under their head, covered with a comfy blanket. Time is suspended as you enter a world of vibration, sensation and experience. Physical injuries can be healed and old emotional traumas released. Great insights can be accessed. You feel truly, vibrantly alive. Once you’ve had your first Sound Bath you’ll certainly want more! Who can have a sound bath? Sound Baths are suitable for people of all ages from young children to the elderly. There are no contra indications. Sound Baths are suitable for pregnant women but in this case the bowls or gongs will not be used close to the body. No previous experience of working with sound or meditation is required. What are the benefits of having a sound bath? One way sound can help create deep states of relaxation is through altering our brainwave states. When our brainwave state moves from the normal waking state (Beta) down to Alpha (conscious relaxed state), Theta (dreamlike state), and sometimes even delta (deep sleep) we experience a decrease in heart rate and blood pressure, our bodies relax, our breath deepens, and we move into a receptive state where deep healing can occur. Sound has profound affects on our nervous system – helping to turn on our parasympathetic nervous system which is our relaxation response. Many of us spend too much time with an active sympathetic nervous system, which is our fight or flight response….when we can active our parasympathetic nervous system we give our bodies a chance to relax and heal. Through all of the various tones of the bowls, gongs and other instruments, the body is offered an opportunity to resonate with a healing frequency. You are in essence giving your body, mind, and energy an opportunity to shift to a higher frequency and let go of lower vibrational thoughts, emotions, and other issues. Cells receive a sonic massage. Helps to connect with your higher self. Helps to release and clear old self-limiting patterns of behaviour, habits and ways of thinking that no longer serve us and are harmful to our health. How many different bowls or instruments do you use during a sound bath session? Could you name or describe some of them? Each sound bath session is a different experience but I always use Tibetan Singing Bowls and Gongs. In addition I may use shamanic drums, Koshi Chimes, Kalimba and Ocean Drum. We may also use our voices to do some chanting. The Tibetan Bowls I use are hand made in Nepal by families who can trace their origins back to the time of the Buddha. The bowls are still hand hammered in the old traditional way and the families chant sacred mantras while they are beating the bowls. When the bowls are played, the spiritual vibrations of these mantras are released. Could you give us some history of sound bathing? Using sound and vibration is one of the oldest healing modalities and was used thousands of years ago in the Aboriginal, Greek and Egyptian cultures. The Aboriginal peoples in Australia were among the first cultures known to heal with sound more than 40,000 years ago. The ancient Egyptians used vowel sound chants in healing, as they believed vowels were sacred. The Greeks used similar healing chants and a variety of musical instruments in their sanatoriums. And, of course, Tibetan monks have used singing bowls, whose vibrations have been described as “the sound of the universe manifesting” for thousands of years. It is interesting to note that most creation stories started with the introduction of sound, including Vedic texts and the Bible. Over the past 15 years or so there has been a resurgence of interest in the power of sound and vibration in healing. Interest in sound therapy and sound baths has been growing steadily during this time as more and more people, western medics included, re-discover its potential. Describe your first personal experience with sound bathing. My first experience of attending a sound bath was a very powerful one and was directly responsible for my decision to train as a sound therapist. I had seen an advert for a talk and demonstration on healing with singing bowls and decided that I would go along. I had sprained my ankle the previous day and it was still very swollen and painful. I was literally hobbling along to the venue. I really enjoyed the talk and the sound bath. As I was walking back to the car after the event I suddenly realised that I had no pain whatsoever and the following morning the swelling was gone. I telephoned the therapist who had given the presentation and she said “I told you that sound and vibration was powerful.” After that I was sold on sound healing and signed up with this teacher for my first training course. Does a person need to do anything to prepare for a sound bath? No, there is no preparation required. It is helpful to keep well hydrated the day before attending or on the day itself if the sound bath is taking place later in the day. Wear loose comfortable clothing without belts and preferably with no metal buttons or fasteners. What should someone bring to a sound bath session? An open heart and mind and a bottle of water! What do you love about sound baths? Seeing how totally chilled out and relaxed people are afterwards and hearing how deeply they have been affected by the experience.